Did you know that Nintendo created its biggest rival back in the early '90s? We've come a long way since the days of the original PlayStation – from the PlayStation 2, to 3, to 4 and now the mid-generation Pro we've seen the console take many forms. That's not even mentioning all the slim variations that came between. As many versions of the PlayStation we've seen, though, do you know about the console that almost became the very first PlayStation? Or rather, Play Station? In fact, it was announced to the public back in 1991 … one day before Nintendo stabbed its partner in the back and announced a deal with Sony's rival Philips instead. It's one of the most amazing stories in gaming history, and one that has only become more intriguing over the last year with the discovery of a prototype Play Station console. The SNES-CD or Super Disc, as it was called internally, was a planned collaboration between Sony and Nintendo to produce an add-on for the Super Nintendo, as well as a standalone console capable of running both Super Nintendo cartridges and Sony-made CD-ROM games. Nintendo and Sony first linked up for the Super Nintendo itself, as Sony produced the S-SMP sound chip for the iconic 16-bit console. Ken Kutaragi, later known as "The Father of PlayStation," developed the chip in secret from his superiors, who didn't want anything to do with the video game business. Luckily, he was able to keep his job once they discovered his project – and when Nintendo began mulling a move to CD-ROMs, they came to him. Check out other PlayStation Week pieces here! A deal was struck back in 1988, and Sony began work on a pair of devices: a CD-ROM peripheral for the Super Nintendo (not unlike the Sega CD) that would run Super Disc games, and a standalone console that could play both SNES (or Super Famicom) cartridges and CDs. Multiple prototypes had been designed and produced, and the companies planned to unveil the hardware to the world at the Consumer Electronics Show (CES) in June 1991. Unfortunately for Sony, Nintendo got cold feet. According to a 2007 feature on Kutaragi at Eurogamer, Nintendo president Hiroshi Yamauchi decided soon before the event that the contract struck between the companies unequally favored Sony rather than its own interests. In essence, Sony would have complete control over the Super Disc format, from software approval to profits from sales of the games, with Nintendo seeing minimal benefit from the arrangement. Fearing that Sony would gain too much power from the deal, Yamauchi dispatched Nintendo of America chairman Howard Lincoln and president Minoru Arakawa to the Netherlands to sign a more lucrative agreement with Philips for a Super Nintendo CD-ROM add-on with a different format. With that deal, Nintendo maintained all rights to its software on the peripheral, and would allow for its characters to appear in Philips' CD games. Sony claimed that it would continue to produce the Play Station console under license from Nintendo. Nintendo suggested that its deal was not broad enough to allow that. However, Sony knew nothing about this deal – and went ahead and announced the Play Station console at CES that summer. One day later, Nintendo announced its deal with Philips for the CD-ROM add-on, effectively stabbing Sony in the back. Sony claimed that it would continue to produce the Play Station console under license from Nintendo, while Nintendo suggested that its deal was not broad enough to allow that. "There is a dispute between Sony and Nintendo as to the terms of the agreement," said Lincoln to The New York Times in June 1991, following the back-to-back announcements. Olaf Olaffson, then-president of Sony Interactive Entertainment, told the paper, "We view this as a very serious matter." In other words, it was a total mess. Sony and Nintendo battled it out in court, as Sony wished to release the SNES-compatible Play Station console without Nintendo's continued support – and Nintendo's attempt to secure a legal injunction over the "Play Station" name failed. In 1992, they struck up a new deal that would have paved the way for the console's release, albeit with Nintendo still making all the money from Super Nintendo cartridge sales. Empowered by its experience building Play Station prototypes, and surely emboldened by Nintendo's shady moves during this whole saga, Sony instead canned the SNES compatibility and opted to develop its own standalone, next-generation CD-ROM console. That ended up being the original PlayStation, of course, and it released in Japan in 1994 and elsewhere in 1995, spawning the most successful console brand over the last two decades. 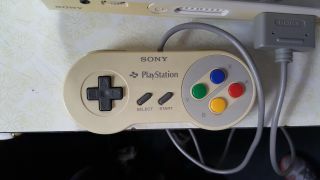 If you've never looked at them closely, compare the SNES's controller ports to the original PlayStation's. Nintendo effectively created its own greatest rival, pulling Sony into the games biz with the promise of a partnership and then pushing them to create something new by axing its ally in a spectacularly public and embarrassing fashion. The Nintendo 64 lagged well behind the original PlayStation in sales, while the GameCube was dwarfed by the PlayStation 2's success. The Super Nintendo CD-ROM add-on was never released, but Philips went ahead and developed and released games featuring Nintendo characters for its CD-i console. And ultimately, Nintendo's partnership with Philips yielded no positive fruit. The Super Nintendo CD-ROM add-on was never released, but Philips went ahead and developed and released games featuring Nintendo characters for its CD-i console. The resulting games, Link: The Faces of Evil, Zelda: The Wand of Gamelon, Zelda's Adventure, and Hotel Mario, are widely considered the worst games in each respective franchise. Photos and sketches of Play Station prototypes appeared over the years, but it appeared that the reportedly 200 completed devices had either been destroyed or successfully sealed away from the public. Well, until last summer, that is. In a truly spectacular discovery, Dan Diebold discovered the Nintendo Play Station (SFX-100) prototype seen here in a box of "junk." His father, Terry Diebold, had worked under Olaf Olafsson at a company called Advanta, and when Advanta went into bankruptcy, Terry purchased some of the remains at an auction. Inside, the pair discovered this relic of gaming history, and Dan shared initial video footage and photos in July 2015. Swivel-chair analysts the Internet over debated the legitimacy of the console, which had the "Sony Play Station" branding all over (even the SNES controller) and the same kind of yellowed discoloration seen on many Super Nintendo consoles. However, in July 2016, hardware hacker extraordinaire Ben Heck was allowed to tear apart the prototype and discover its inner workings. Based on what Heck found, he surmised that the Play Station – at least in its prototype form – would have been about on par with the standalone Super Nintendo in graphics quality, and may have been less powerful than the Sega CD and Genesis together, for example. Heck did more than just open up the Play Station prototype, however – he also got it working again to some extent. Taking out the non-functioning CD drive, he was able to power up the console and play Japanese and American cartridges. With extensive tinkering, he restored power to the CD drive (even if it's not reading discs yet) and got both video and audio output functioning once more. Even if they manage to get the CD-ROM drive fully working again, they don't have anything official to play: there are no known SNES-CD game discs in existence, although Heck's video suggests that the Diebolds may have something amidst the rest of the junk purchased from that auction. Meanwhile, the homebrew community is working to fill the gap: Super Boss Gaiden is a new game designed to run on a burned SNES-CD disc, and it's a side-scrolling action game about Sony's boss raging out when a Play Station prototype is found in the wild. Pretty perfect, right? We'll see if the story of the Nintendo/Sony partnership and the Play Station prototype gains any new wrinkles over time, but even if not, it's a fascinating tale of unexpected origins and corporate shenanigans – and a nice reminder not to screw over powerful allies.